It’s playoff time once again! 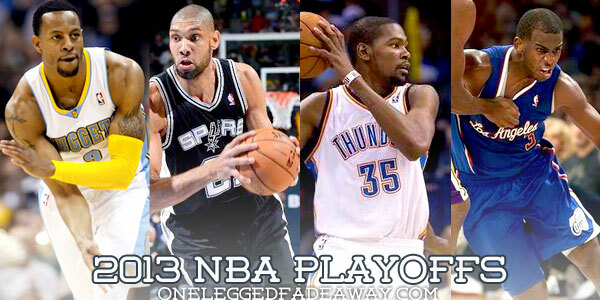 Join us as we give our take on the matchups, along with some fearless forecasts on the upcoming NBA playoffs. Let’s start with the Western Conference, which had a very busy last day of the regular season as teams jockeyed for position. Golden State and Houston return to the playoffs, and the Lakers barely made it in but managed to snag the seventh seed once the dust settled. Anyway, here are the matchups and our breakdowns. Enjoy! RB: For the second straight postseason, the Clippers and the Grizzlies meet in the first round. Just like last year, these two teams are quite evenly matched. The contrasting styles of these teams’ frontcourts should be interesting to watch. The Clippers have some issues on defense, but I don’t think the Grizzlies will be able to take advantage of those. Ultimately, I think this series will come down to how much the Grizzlies defense can contain Chris Paul to prevent him from just taking over. My pick: Clippers in 7. Ryan: This should be an exciting rematch of last year’s first-round matchup, which the Clippers won in seven games. The Grizzlies enter the series with a renewed focus, but the Clippers are riding high with a 7-game win streak heading into the playoffs. The frontcourt matchup should be great, but I think the Clippers backcourt will decide this series. My pick: Clippers in 6. RB: This series should be a lot of fun. I don’t think the Nuggets are going to miss Gallo here, specially with the way Corey Brewer and WIlson Chandler have been playing lately. The Warriors, who started the season very well on defense, have had real struggles on that end. Bogut doesn’t look like he’s 100%, so I don’t know how much he can help them there. Steph Curry will probably be spectacular in his first playoff appearance, but I just don’t think his Dubs can outscore the Nuggets. My pick: Nuggets in 6. RB: Ask yourself this: When has a Mike D’Antoni-coached team beaten a Gregg Poppovich-coached team in the playoffs? That’s right. Never. And I don’t think that’s going to change now. Yes, the Spurs seem banged up, and yes, the Lakers have played better recently, but I just don’t see a way for LA to beat San Antonio without Kobe. The Spurs have been better defensively this year, and their offense will tear LA’s non-existent defense to shreds. My pick: Spurs in 5. Ryan: This might seem like the best matchup for Lakers fans, but don’t count the Spurs out. They only kept their big guns from playing to rest them (well, except Manu). Expect the same methodical and efficient performance from the Spurs come playoff time. They may encounter some difficulty with the Lakers’ new focus on offense (not to diss on KB24, but few teams can hang with the duo of D12 and Gasol). My pick: Spurs in 5. RB: I think this series has the potential to set the record for the most free throw attempts…ever. That aside, I think OKC will put the clamps on James Harden and Jeremy Lin, effectively stalling Houston’s offense. The Rockets can’t stop OKC, so I think this series will be short. My pick: Thunder in 5. Ryan: Can’t write this part without any bias, so I’ll just keep it short. The Beard will return to OKC to see just how tough life can get in the postseason without two other beasts alongside him. My pick: Thunder in 5.